French version of pie crust. A smooth flaky dough used for sweets, quiche and even pies (if shortening is not available). 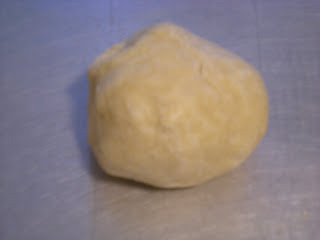 This dough is done in the same fashion as the piecrust. 1. In a large bowl, mix flour, salt. Add margarine. 2. Rub margarine into flour with fingers to obtain coarse crumbs. 3. Add cold water and incorporate with a fork. The pastry will amalgamate. 4. Finish by reassembling the pastry to a ball, do not overwork the pastry. 5. Place pastry ball into a plastic and let it in the fridge for at least an hour.